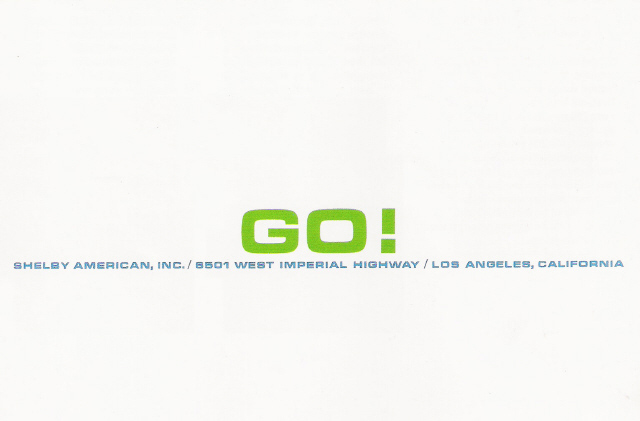 While in some cases it is difficult to tell for sure if a car in an ad or brochure is a Carryover Car, in other instances it is clear the car being used is a Carryover. 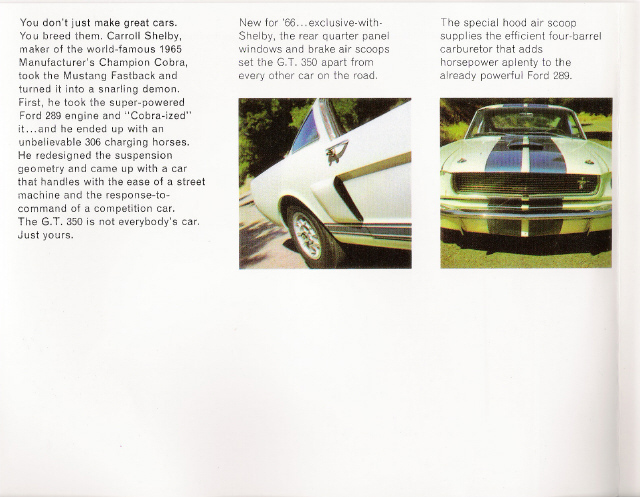 The 1966 Dealer brochure shown below extolling the virtues of the 1966 GT-350 is an example of one of the publications where it is clear the car being used is a Carryover. 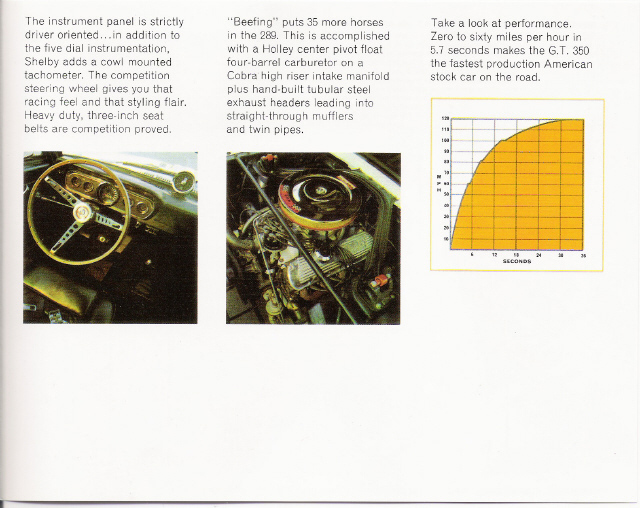 In the brochure, the interior shot shows a 1965 Dash Cluster and 1965 Door Panels coupled with 1966 Exterior. 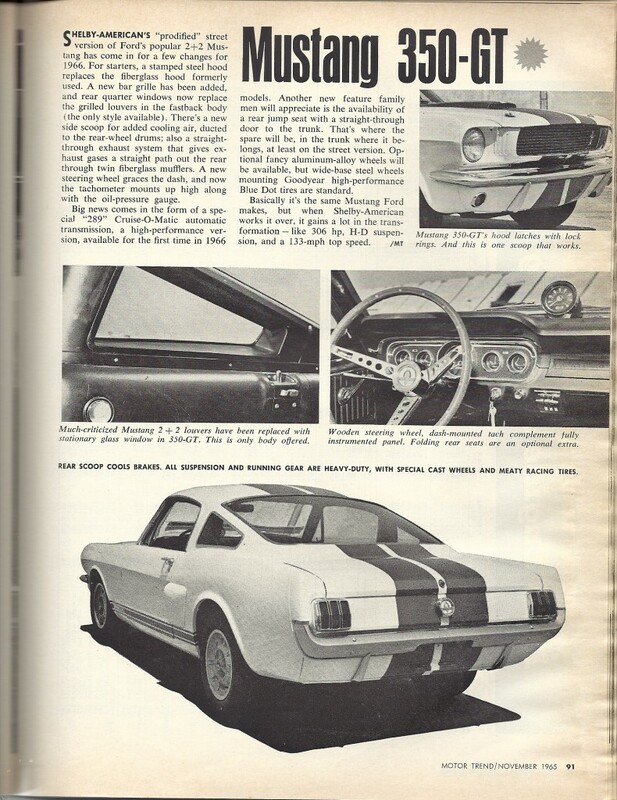 It should also be noted the engine is black (a 1965 Mustang Feature) and the page 5 drawing shows a 1965 door panel. 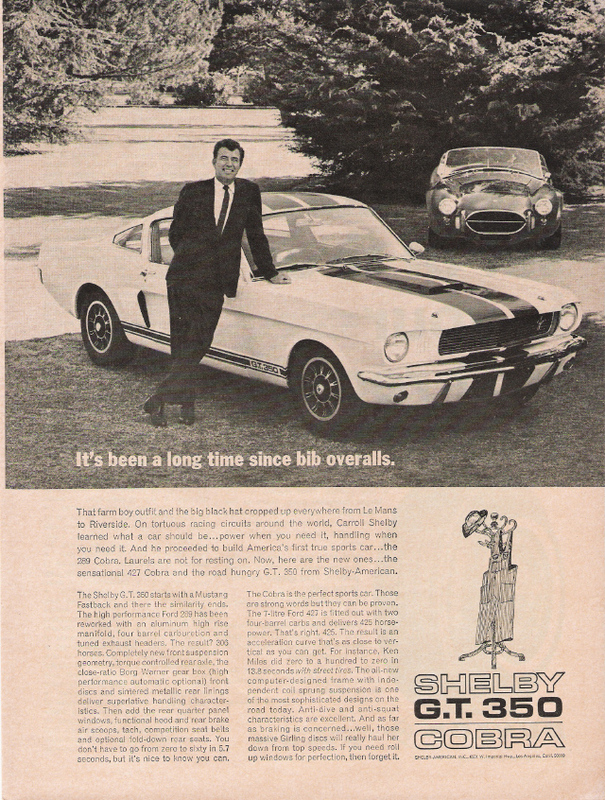 Less definitive is the ad below, but there are still clues that lead to the conclusion that it could be a carryover car. There is nothing clear, but a different picture taken at the same time shows this car as having a package tray and it looks like the driver’s seat has ’65 upholstery. 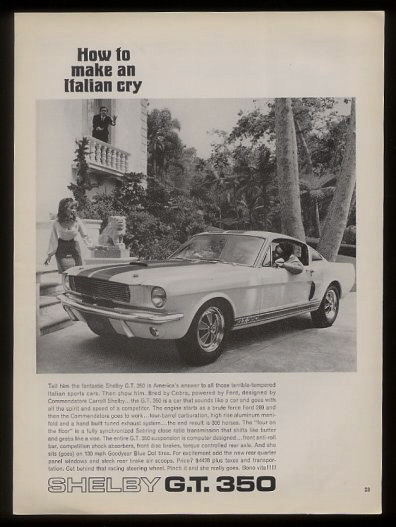 In the Make an Italian Cry ad (below) the car sports the optional Cragar wheels and some believe the apparent lowered front end point to a high probabilty of this being a carryover. 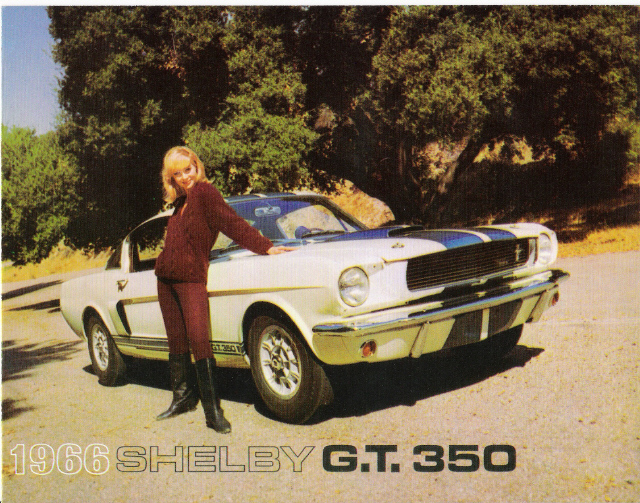 But further research reveals that this is really 5S319 mocked-up to look like a 1966 GT350 for the ad. 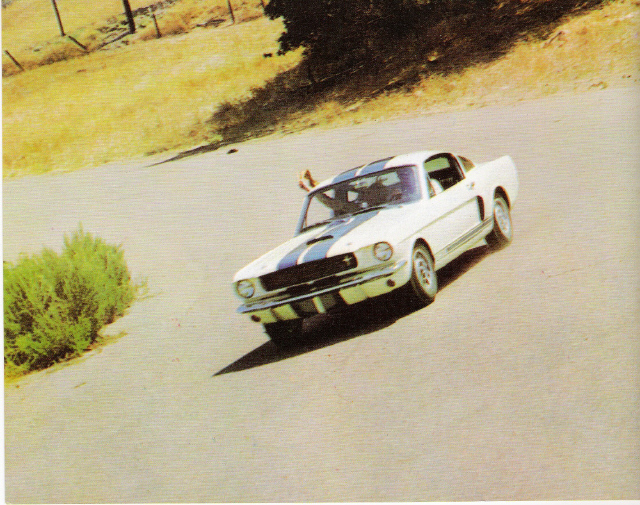 Below is a very early article on the new 1966 350-GT from the November 1965 Motor Trend. 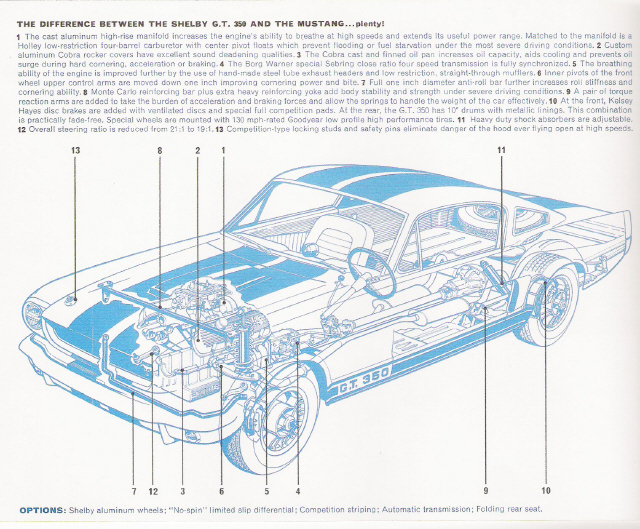 In the test there are few errors compared to what was actually delivered , but with the article going to print in August or September of 1965 some inaccuracies were bound to occur. The car pictured has an interetsting Tach and sports 10 spoke wheels instead of the Cragars or Steel Wheels but provides and early glimpse of the body style that was to come.